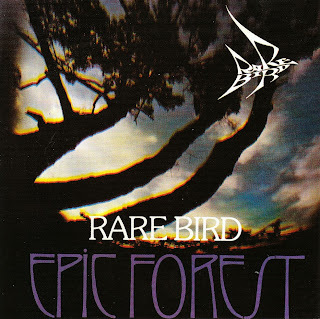 Rare Bird formed in London in 1969 and rapidly became one of the standard-bearers for the new neo-classical, keyboard-driven strain of British progressive rock. Whilst eschewing the pompous on-stage approach of ELP and Yes, they exhibited an equally impressive musical pedigree. Unusually, they included no guitarist, the four-man line-up consisting of organ, electric piano, bass guitar and drums. Classically-trained organist Graham Field’s songwriting and bassist Steve Gould’s powerful, soulful voice yielded an immediate UK and pan-European hit single in “Sympathy”, and this line-up subsequently recorded two moderately well-received but sparingly purchased albums. Field then announced his departure and the Bird was forced to re-fledge. Moving from one extreme to the other, it became a twin-lead-guitar outfit, though retaining pianist Dave Kaffinetti, with Gould upgrading from four strings to six and new second guitarist/singer Ced Curtis giving them fine opportunities for harmonies, both instrumental and vocal. 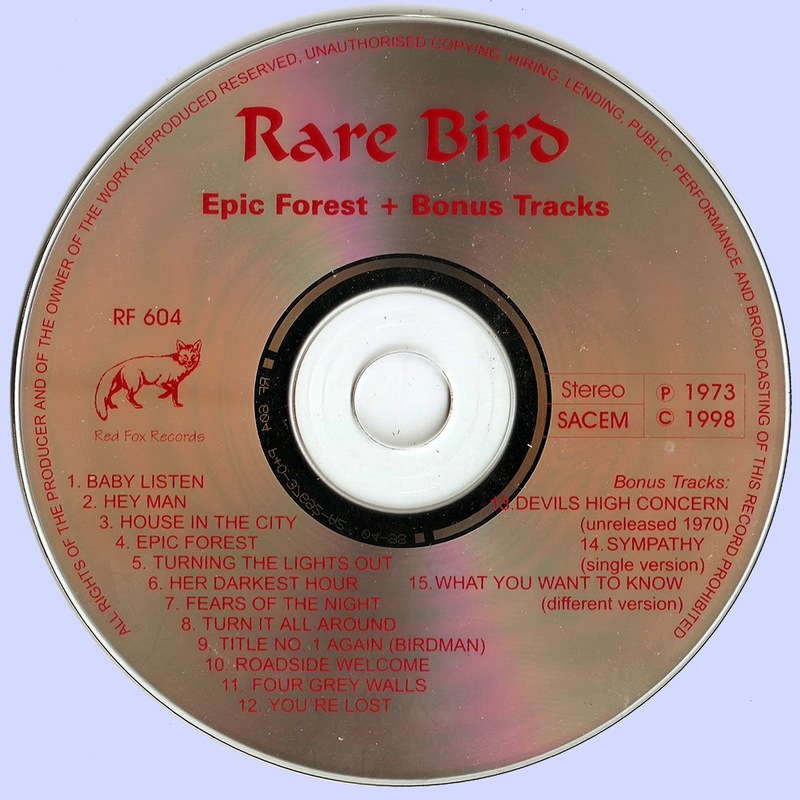 The first album to feature the new roster appeared in 1972, its title a skit on Epping Forest, a sylvan suburb of the capital. It displays two of the dominant threads of mainstream UK rock music of the time: the melodic guitar-driven soft-rock approach of bands in the Wishbone Ash mould and the soaring close-harmony vocals lifted from Californian good-time outfits such as CS&N. With two first-class singers and the extra dimension provided by Kaffinetti’s organ, piano and synth work, it’s probably fair to say that this incarnation of Rare Bird transcends the Wishbone template. Sadly, unlike the latter this didn’t translate into gratifying record sales: possibly their change of direction alienated their original prog-rock supporters, whilst a potential new soft-rock fan base may have wrongly construed them as old, po-faced art-rockers. Such are the vagaries of rock fame! They certainly achieved more penetration in Europe than at home, whilst recognition in America eluded them almost completely. The Bird flew haltingly on for a further four years, suffering several further changes of personnel and releasing two further albums to modest critical acclaim but little commercial success before bowing to the punk-powered inevitable. 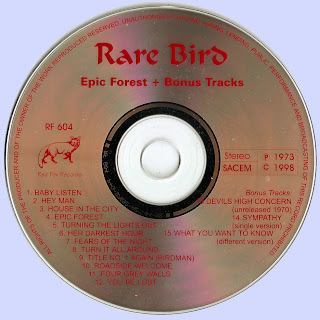 Having recorded more material for Epic Forest than required for a conventional single-disc vinyl release and not wishing to shelve any of the completed tracks, Rare Bird adopted the then novel tactic of pressing three of these as a maxi-single included free with the album. The twelve tracks, totalling over sixty minutes of music, exhibit a uniformly high quality in the writing, singing, playing and production. Up-tempo and languid compositions alternate, electric and acoustic guitars predominate, but the support from Kaffinetti’s keyboards and the rhythm section of Paul Karas on bass and Fred Kelly on kit is unerringly solid. The two opening tracks set out the menu; I love the simple, powerful bass riff that drives “Baby Listen” and the ensemble guitars and harmonies on the much softer “Hey Man”. There are some harder touches; on “Turn It All Around”, they even move mildly into riff-rock territory, Zeppelin style, after a deceptively quiet intro. The extended instrumental interludes on the nine-minute title track and on the ten-minute closer “You’re Lost” were clearly as enjoyable for the musicians as they will be to the listener, on the evidence of their final whoops of satisfaction on the latter’s fadeout. Words and Music by C. Curtis, D. Kaffinetti, F. Kelly, P. Karas, S. Gould except where stated. Many thanks to all and congratulations for your great side.